The spectacular Cobb Course offers a staggering range of variety with features including 51 sand bunkers, more than over 200 feet of elevation change and 8 lakes. This one-of-a-kind golf course at The Resort at Glade Springs was designed by the prolific golf course architect, George Cobb, and is the only course he designed to bear his name. Stretching over 7,121 yards from the black tees, the Cobb Course has strategically placed fairway bunkers that will surely put your golfing skills to test. Cobb Course holds pride with its place among golf courses in West Virginia and all of North America. Golf Digest consistently ranks the Cobb Course among the top 5 in the state. It has also been acclaimed by Golf Magazine as the #1 golf course in West Virginia in 2007. The 16th hole of the course is considered to be one of the most outstanding holes. The 420-yard par 4 is the first of three remarkable finishing holes, and golfers are forced to carry water three different times. 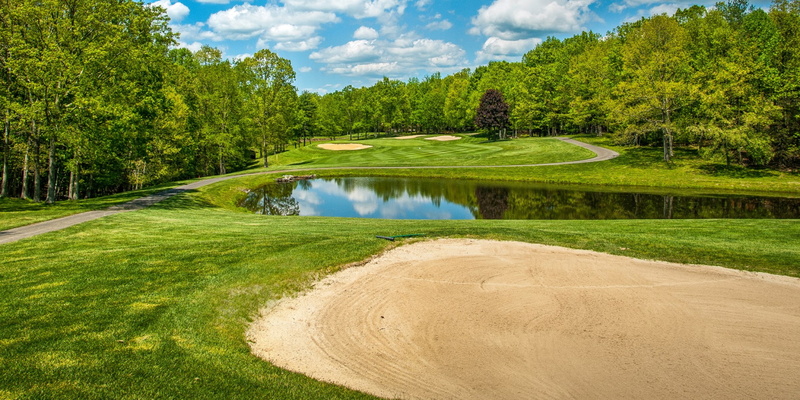 The Cobb Course at the Resort at Glade Springs is open to guests staying at the Resort, and to Members of the Glade Springs Golf and Country Club. Cart included in greens fees. The Resort at Glade Springs is conveniently located at the juncture of Interstate 77 (West Virginia Turnpike) and Interstate 64 near Beckley, West Virginia. Using I-64: take exit 125A (Beaver exit). Drive 1.5 miles on SR 307 South to light. Turn left at light onto US Route 19 South. The Resort at Glade Springs will be located 2.5 miles from this light on the left. Using I-77; take exit 28 (Ghent exit). Follow SR 48 East 0.1 miles to US Rt. 19, and turn left onto Route 19 North. The Resort at Glade Springs will be located 7.5 miles from this intersection on the right. Tee times must be booked in advance and are subject to availability. Tee times on the day of arrival are available after 2pm. The Resort at Glade Springs reserves the right to change course or tee time up to 7 days prior to requested tee time. No rain checks or refunds will be issued for golf that is included as part of a resort package. * Unlimited use of The Leisure Center featuring steam, sauna, hot tubs, work out area, aerobics, yoga, indoor tennis, as well as basketball, bowling, video arcade, and cinema room. Please contact Memberships Director Rebecca Blaine at rblaine@gladesprings.com for pricing and more information. Contact The Resort at Glade Springs: Cobb Course at 888-329-2714 for more information and details on holding a golf outing at the course. * 3 Manor Houses, with amenities similar to our extended-stay Chestnut Hill lodges, these Houses are subdivided into 8 spacious extended-stay suites on two floors. The unique floorplan allows a guest to reserve just one suite, or up to all eight! * 8 Oak Lane Villas, our premium accommodation, each a spacious home with room for up to twelve persons featuring beautiful views of our Cobb Course. * Glade's Italian Grill, semi-formal Italian famiglia-style dining. * Bunker's Sports Bar, casual dining featuring classic American fare. * Small-Talk Cafe, light dining, coffees and pastries. * The Rotunda, serving daily breakfast to resort guests, the kitchen at the Rotunda can also cater tailored meals for special events. A new outdoor Pavilion adjacent to our clubhouse also serves as a venue for catered events. * Full-body massages, including deep-tissue Swedish treatments, warm stone massage, aromatherapy massage, stretch massage, foot reflexology and pregnancy massage. * Body polishes, including sea salt polish, aromatherapy polish and chocolate sugar body polish. * Body wraps, including detoxifying wrap, rose petal wrap, "breathe easy" wrap with facial massage, and the signature "Spa Orange" wrap. * Facials, including the signature "Spa Orange" facial, specialty facials for acne and rosacea, stem cell facial, gentlemen's facial, and the premium enzymatic and collagen facial treatment. Watch the The Resort At Glade Springs: Cobb Course Video. This profile was last updated on 02/05/2015 and has been viewed 12,015 times.